US Naval Research Laboratory (NRL) scientists J. D. Purcell, C. Y. Johnson, and Dr. F. S. Johnson among those recovering instruments from a V-2 used for upper atmospheric research above the New Mexico desert. This is V-2 number 54, launched January 18, 1951 (photo by Dr. Richard Tousey, NRL). This is an image of a gigantic jet above a thunderstorm near the Philippines. Credit: H. T. Su, R. R. Hsu, A. B. Chen, Y. C. Wang, W. S. Hsiao, W. C. Lai, L. C. Lee, M. Sato & H. Fukunishi. Comet Lulin was passing through the constellation Libra when the Swift Gamma-Ray Burst Mission imaged it on January 28, 2009. This image merges data acquired by Swift's Ultraviolet/Optical Telescope (blue and green) and X-Ray Telescope (red). At the time of the observation, the comet was 99.5 million miles from Earth and 115.3 million miles from the Sun. Credit: . The Crab Nebula is a remnant of an exploded star. This is the Crab Nebula in various energy bands, including a hard X-ray image from the HEFT data taken during its 2005 observation run. Each image is 6′ wide. Credit: NASA. Chandra X-ray Observatory imaged Cygnus X-1. Credit: Chandra: NASA/CXC. Classified as a peculiar star, Eta Carinae exhibits a superstar at its center as seen in this image from Chandra X-ray Observatory. The new X-ray observation shows three distinct structures: an outer, horseshoe-shaped ring about 2 light years in diameter, a hot inner core about 3 light-months in diameter, and a hot central source less than 1 light-month in diameter which may contain the superstar that drives the whole show. The outer ring provides evidence of another large explosion that occurred over 1,000 years ago. Credit: Chandra Science Center and NASA. On the left is a Chandra X-ray Observatory X-ray image that reveals a large cloud of hot gas that extends throughout the Hydra A galaxy cluster. Image is 2.7 arcmin across. Right ascension (RA) 09h 18m 06s Declination (Dec) -12° 05' 45" in the constellation Hydra. Observation date: October 30, 1999. Instrument: ACIS. Credit:NASA/CXC/SAO. On the right is an image that has the radio image of Greg Taylor, NRAO, overlain on the X-ray image from Chandra. The radio source Hydra A originates in a galaxy near the center of the cluster. Optical observations show a few hundred galaxies in the cluster. Credit:NASA/CXC/SAO; Radio: NRAO. On the left is a visual image of Arp 270. Credit: Aladin at SIMBAD. Chandra X-ray Observatory image on the right of two galaxies (Arp 270) in the early stage of a merger in the constellation Leo Minor. In the image, red represents low, green intermediate, and blue high-energy (temperature) X-rays. Image is 4 arcmin on a side. Right ascension (RA) 10h 49m 52.5s Declination (Dec) +32° 59' 06"
. Observation date: April 28, 2001. Instrument: ACIS. Credit: NASA/U. Birmingham/A. Read. The Chandra X-ray Observatory X-ray image on the left of radio galaxy Pictor A shows a spectacular jet emanating from the center of the galaxy (left) that extends across 360 thousand lyr toward a brilliant hot spot. The bright spot at the right in the image is the head of the jet. Image is 4.2 arcmin across. RA 05h 19m 49.70s Dec -45° 46' 45" in Pictor. Instrument: ACIS. Credit: NASA/UMD/A.Wilson et al. The composite image on the right contains X-ray data obtained by Chandra at various times over 15 years (blue) and radio data from the Australia Telescope Compact Array (red). Credit: X-ray: NASA/CXC/Univ of Hertfordshire/M. Hardcastle et al., Radio: CSIRO/ATNF/ATCA. A launch of the Black Brant 8 Microcalorimeter at the turn of the century as a part of the joint undertaking by the University of Wisconsin-Madison and NASA's Goddard Space Flight Center known as the X-ray Quantum Calorimeter (XQC) project. Credit: Dan McCammon at Wisconsin and by Andrew Szymkowiak and Scott Porter at Goddard. This ROSAT PSPC false-color image is of a portion of a nearby stellar wind superbubble (the Orion-Eridanus Bubble) stretching across the constellations Eridanus and Orion. Credit: David Burrows and Zhiyu Guo, Penn State Department of Astronomy & Astrophysics. X-ray photo is by the Chandra X-ray Observatory of the Bullet Cluster (two colliding galaxy clusters). Exposure time was 140 hours. The scale is shown in megaparsecs. Redshift (z) = 0.3, meaning its light has wavelengths stretched by a factor of 1.3. Credit: Mac_Davis. The GOES 14 spacecraft carries a Solar X-ray Imager to monitor the Sun’s X-rays for the early detection of solar flares, coronal mass ejections (CMEs), and other phenomena that impact the geospace environment. Credit: NWS Internet Services Team. The Swift Gamma-Ray Burst Mission, Swift XRT, contains a grazing incidence Wolter I telescope to focus X-rays onto a state-of-the-art CCD. The complete mirror module for the XRT consists of the X-ray mirrors, thermal baffle, a mirror collar, and an electron deflector. To prevent on-orbit degradation of the mirror module's performance, it is maintained at 20 ± 5 °C, with gradients of <1 °C by an actively controlled thermal baffle (purple, in the schematic) similar to the one used for JET-X. A composite telescope tube holds the focal plane camera (red), containing a single CCD-22 detector. Credit: Swift PI: Neil Gehrels, Responsible NASA Official: Phil Newman, Web Curator: J.D. Myers, PAO Contact: Francis Reddy. The Chandra X-ray Observatory and the Inertial Upper Stage sit inside the payload bay on the Space Shuttle Columbia mission (STS-93). Credit: NASA. Jupiter shows intense X-ray emission associated with auroras in its polar regions (Chandra X-ray Observatory X-ray image on the left). The accompanying schematic illustrates how Jupiter's unusually frequent and spectacular auroral activity is produced. Observation period: 17 h, 24-26 February 2003. Credit: X-ray: NASA/CXC/MSFC/R. Elsner et al. ; Illustration: CXC/M. Weiss. The Chandra X-ray Observatory has imaged the center of the Andromeda galaxy. Like the Milky Way, Andromeda's galactic center appears to harbor an X-ray source characteristic of a black hole of a million or more solar masses. Seen above, the false-color X-ray picture shows a number of X-ray sources, likely X-ray binary stars, within Andromeda's central region as yellowish dots. The blue source located right at the galaxy's center is coincident with the position of the suspected massive black hole. While the X-rays are produced as material falls into the black hole and heats up, estimates from the X-ray data show Andromeda's central source to be very cold - only about million degrees, compared to the tens of millions of degrees indicated for Andromeda's X-ray binaries. Credit: S. Murray, M. Garcia, et al., Authors & editors: Robert Nemiroff (MTU) & Jerry Bonnell (USRA), NASA Technical Rep.: Jay Norris. Chandra X-ray Observatory observations of the central regions of the Perseus galaxy cluster are at left. Image is 284 arcsec across. Right ascension (RA) 03h 19m 47.60s Declination (Dec) +41° 30' 37.00" in the constellation Perseus. Observation dates: 13 pointings between August 8, 2002 and October 20, 2004. Color code: Energy (Red 0.3-1.2 keV, Green 1.2-2 keV, Blue 2-7 keV). Instrument: ACIS. Credit: NASA/CXC/IoA/A. Fabian et al. On the right is a composite image og the behemoth galaxy NGC 1275, also known as Perseus A, that lies at the centre of Perseus Galaxy Cluster. Hubble data from the Advanced Camera for Surveys covers visible-light wavelengths and is shown in the red, green and blue. Radio data from NRAO's Very Large Array at 0.91 m was also used. In this composite image, dust lanes, star-forming regions, hydrogen filaments, foreground stars, and background galaxies are contributions from the Hubble optical data. The X-ray data contributes to the soft but violet shells around the outside of the centre. The pinkish lobes toward the centre of the galaxy are from radio emission. The radio jets from the black hole fill the X-ray cavities. Chandra data from the ACIS covers X-ray wavelengths from 0.1771 to 4.133 nm (0.3-7 KeV). This is a ROSAT false-color image in X-rays between 500 eV and 1.1 keV of the constellation Chamaeleon, Chamaeleon I dark cloud. The contours are 100 µm emission from dust measured by the IRAS satellite. Credit: D. Burrows, J. Mendenhall, and E. Feigelson. Penn State University using the US/German ROSAT satellite. 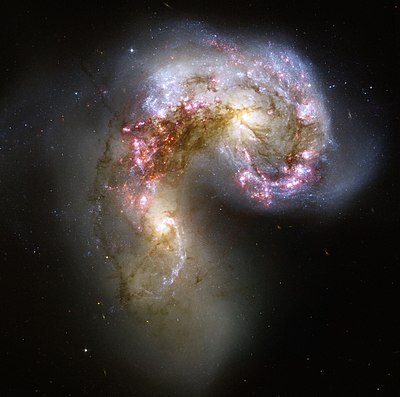 The Antennae galaxies are in Corvus. This NASA Hubble Space Telescope image of the Antennae galaxies (NGC 4038 & 4039) is the sharpest yet of the merging pair of galaxies. Credit: NASA, ESA, and the Hubble Heritage Team (STScI/AURA)-ESA/Hubble Collaboration. This is an image of the instrument called the Proportional Counter Array on the Rossi X-ray Timing Explorer (RXTE) satellite. Credit: NASA Official: Ruth Netting. RHESSI observes high-energy phenomena from a solar flare. Credit: NASA/Goddard Space Flight Center Scientific Visualization Studio. This X-ray Landmarks frame highlights a variety of X-ray objects, including X-ray binaries, supernova remnants, and active galaxies. The rectangular image is a magnification of the center of our Milky Way galaxy, which has a high density of X-ray stars. The Crab Nebula is in the constellation Taurus at RA ~05h Dec 22. The Large Magellanic Cloud is at RA ~05h Dec -70 in the constellations Mensa\Dorado. NGC 4151 is in Canes Venatici at RA ~+12h Dec +39 Scorpius X-1 is at RA ~16h Dec -15. The center of the Milky Way in the frame is at RA ~17h Dec -29. Cygnus X-1 is at RA ~20h Dec +35. Cassiopeia A is at RA ~23h Dec +58. The point of view of the frame is in plane of the galaxy, at the 98° point looking edge on at the galaxy. There are 88 official constellations that the International Astronomical Union (IAU) has used to divide the celestial sphere into 89 irregularly shaped boxes. The constellation Serpens is split into two separate sections, Serpens Caput (the snake's head) to the west and Serpens Cauda (the snake's tail) to the east. Using detectors placed above the Earth's atmosphere, X-radiation has been detected as incoming from each of these constellational areas. Searching for the first X-ray source per constellation is a history of science exercise that is still ongoing as the initial X-ray source for many of the constellations is questionable or unknown. Compare the Chandra X-ray Observatory X-ray image on the right with the Hubble Space Telescope visual image on the left. Sirius A is spectral type A1V, whereas Sirius B is a white dwarf of type DA2. If you have a suggestion for future Selected images for this portal, please suggest them on the discussion page, or create them yourself. You can also suggest future Selected images at Portal talk:Radiation astronomy/Image. If you have any questions, contact User:Marshallsumter or leave a message at Astronomy. This page was last edited on 10 April 2018, at 19:33.